The Combined Aerothermal and Radiometer Sensors Instrument Package, COMARS+, will measure aerothermal parameters on the exterior of the ExoMars 2016 Schiaparelli entry, descent, and landing demonstrator module as it passes through the Martian atmosphere. COMARS+ consists of three combined sensors (COMARS) spaced equally across the back cover of Schiaparelli, one broadband radiometer, and an electronic box (inside the module). The entire package weighs 1.73 kg and draws 4.5 W of power. The sensors, located on the back cover of the module, will measure the pressure, the temperature of the module's surface, the rate at which heat energy is transferred to the surface (total heat flux rate), and the amount of radiated heat from the hot gas to the back cover (radiative heat flux). Two so-called ICOTOM narrow band radiometers in each COMARS sensor are provided by CNES. 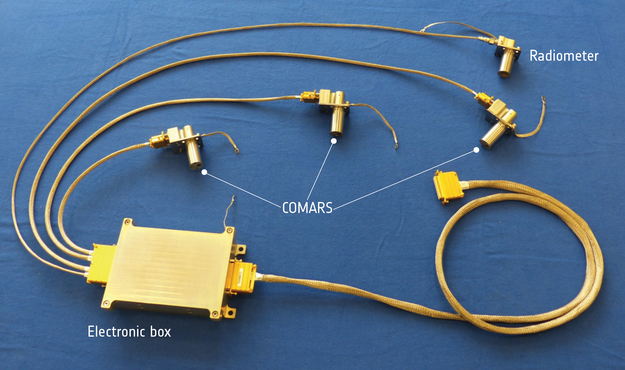 In addition, a broad-band radiometer provided by DLR is integrated close to the COMARS 3 sensor. The data produced from this instrument package will provide essential input for the improved design of future missions landing on Mars. The COMARS+ package is provided by the German Aerospace Center, (Deutsches Zentrum für Luft- und Raumfahrt, DLR).